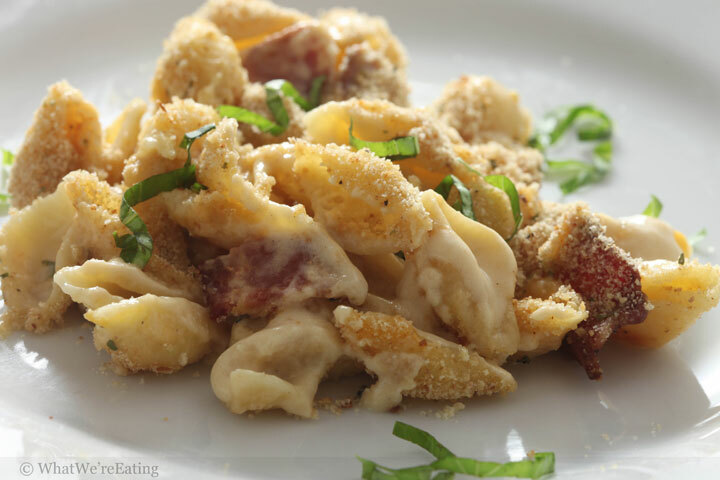 We’re eating uber-creamy macaroni and cheese filled with sharp cheddar, herb chevre, buttery brie, applewood-smoked bacon, sun-dried tomatoes and fresh basil topped with Italian bread crumbs for an extra crunch. Oh macaroni and cheese, what a love/hate relationship we have! I love you! I love you deeply, deeper than words can describe… but you’re soooooooooo bad for me! You’re like that super hot bad boy on the motorcycle with all the tattoos doing naughty things that feel oh-so-right. When I make you, I have an “eff it all” attitude like I have when I meet said aforementioned biker. I throw caution to the wind for just one night. I mean, when you’re using a pound of cheese in a recipe, why not go ahead and throw in some bacon… and if you need butter for the roux anyway, why not substitute 1 of those tablespoons with bacon fat for that extra naughty bacony goodness flavor? I’m pretty sure I read somewhere one time that bacon fat is no worse for you than butter, so what the hell? Substitute all the butter in the recipe with bacon fat if you’re really feeling mischievous. I developed this bad boy biker of a mac & cheese recipe as part of the Knorr4 so of course the bechamel-based cheese sauce is spiked with at tub of Knorr Homestyle Chicken Stock for an extra depth of flavor. I mean, bikers can be deep right? 😉 Go ahead, make this mac & cheese and be a little naughty. I guarantee you’re gonna enjoy yourself. Place a large pot of water over high heat. Season liberally with salt and bring to a boil. Place a medium-sized saucepan over medium heat. Preheat pan for 2 minutes then add bacon fat and butter to the pan. Once the butter has melted add the flour to the pan. Cook flour, whisking constantly, for 1 minute. Slowly pour in the whole milk while whisking vigorously to dissolve the roux into the milk. If the milk is poured in too quickly, the sauce will be lumpy and flour will not dissolve. Once all of the milk has been incorporated into the roux, add the ground mustard, freshly cracked black pepper and Knorr Homestyle Chicken Stock to the saucepan. Stir to incorporate. Allow the the roux to come to a simmer, stirring occasionally, making sure to scrape the bottom to prevent scorching. Simmer until thickened. While waiting for the sauce to come to a simmer, add the macaroni to the large pot of boiling salted water. Cook according to the instructions on the manufacturers package. Drain in a colander then return to pot. Once the sauce has thickened remove from heat and add cheddar, herb chevre, and brie. Stir until cheese has melted. Taste sauce then adjust seasoning as desired with kosher salt. Do not season the sauce until the cheese has been added as the stock and cheese are both naturally salty. Pour cheese sauce over macaroni in pot. Add bacon, basil and sun-dried tomatoes. Stir to mix thoroughly. Pour mixture into a glass or ceramic 9" x 13" baking dish. Sprinkle bread crumbs evenly over the top of the macaroni and cheese. Place in preheated 425 degree oven until the bread crumbs begin to brown and the cheese sauce is bubbly, about 20 minutes. Remove from oven and let cool 5 minutes before serving. Garnish with fresh basil if desired. Enjoy! Be still my beating heart! That sounds phenomenal! I never could resist a bad boy. I don’t care if all of my arteries close up. I have to try this. It sounds amazing. Saw this on foodporndaily, and had to make it. Scaled it down for 2 people, the cheese sauce was incredible, but I think I used too much bacon because it was kind of overpowered in the final product. The tomatoes were a nice addition. I’ll make this again… in a couple of months, when I’ve recovered! That looks DAYUM good!!!! I will definitely go try that Knorr Stock. DELICIOUS! I made this the other night and it definitely did not disappoint. I couldn’t find the Knorr’s Chicken Stock, so I substituted with their beef one, and it was still great. Thank you for sharing another fabulous recipe! This looks and sounds so, so good! You had me at brie! I made double the amount for a dinner party for 12 people. It was absolutely the favorite dish!! YUM!!! This recipe sounds amazing…I cannot wait to try it!